Going With Whole Grains Resolutions are so last decade. This year, share a New Year's revelation: Whole grains aren't just good for you — they taste great, too. And less familiar varieties like quinoa, bulgur and farro can help keep a wholesome new diet from becoming humdrum. Get recipes for Whole-Grain Pancakes, Whole-Grain Ginger-Pear Cake, Polenta Gratin With Leeks, Swiss Chard And Gruyere, Bulgur-Mushroom Pilaf With Grilled Butternut Squash Kebab, and Tuscan Farro And Bean Soup (Minestra Di Farro). In the early days of a new year, I am full of virtuous resolve: I will write more real-mail letters, I will read some new-to-me authors, I will go for meandering walks, I will make more beet salads, I will up my whole grains consumption. As a new decade dawns, it would behoove me to try out new recipes and ways of mixing up the old favorites — and all in the interest of good health. I must admit, I already do keep to a fairly steady diet of grains and vegetable protein (not to mention beet salads). I'm certainly quinoa's No. 1 fan and have learned to like — even love — whole-wheat pasta. In fact, I think I actually prefer chewier, heartier whole grains to their refined cousins and most likely will always reach past the white bread in favor of a seven-grain loaf. Still, I mostly adhere to my tried-and-trues: the aforementioned quinoa, brown rice, whole-wheat penne, a handful of bulgur here and there, maybe a barley soup in the middle of winter. I'm in danger of being humdrum. 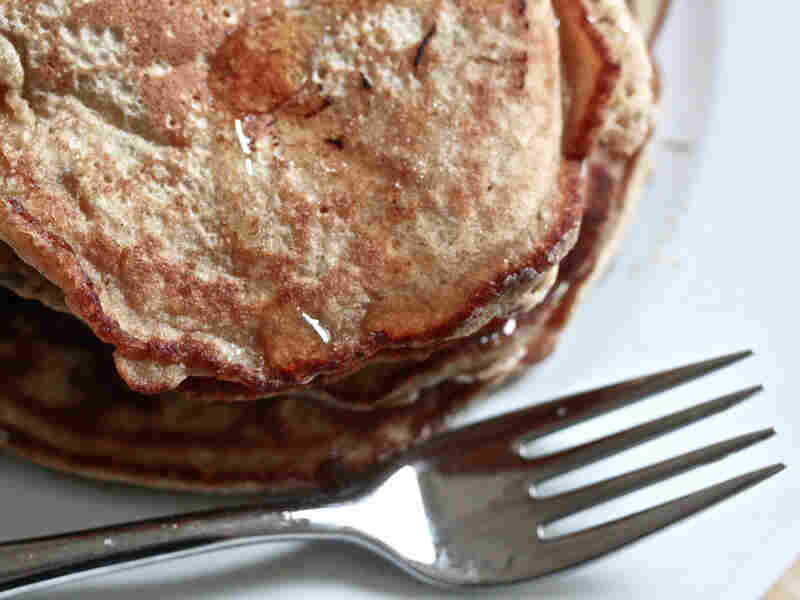 While I've long experimented with wheat flour in place of white in chocolate cakes to great success, I haven't explored much further — say, for example, slipping whole-wheat pastry flour into a sticky, ginger-infused tea bread or a platter of pancakes. And why haven't I swapped farro for Arborio rice to make a healthier, cunningly named farrotto? Or stopped buying white rice altogether in favor of brown or wild varieties? Perhaps I should amend that resolution to read: I will up my whole grains consumption and try some unfamiliar varieties — teff, for example, or amaranth. All that quinoa keeps me happily protein-filled and sated but it doesn't do to fall into a rut. After all, as a new decade dawns, it would behoove me to try out new recipes and ways of mixing up the old favorites — and all in the interest of good health. Nicole Spiridakis lives in San Francisco and writes about food, travel and her native state on her blog, cucinanicolina.com. Her work has appeared in the New York Times, the San Francisco Chronicle, chow.com and other publications. Enter whole grains, which haven't had their bran and germ removed by milling and thus are considered a better source of fiber and other nutrients such as B vitamins, vitamin E, selenium, potassium, magnesium, iron and fiber, as well as other valuable antioxidants, than refined grains. Whole grains contain the entire grain kernel (the bran, germ and endosperm) and include brown rice, buckwheat, farro, millet, oatmeal, whole-wheat flour and whole cornmeal, among others. Whole grains have been shown to decrease cholesterol levels, blood pressure and risk of heart disease, and some studies have found whole grains help reduce the risks of many types of cancer. The FDA recommends eating at least three one-ounce equivalents of whole grains per day. When trying to determine whether a packaged food product contains whole grain, look for the word "whole" in the ingredient list. Also, the first item on the list should be a whole grain. For novices, incorporating more whole grains into the diet may seem daunting, but it needn't be. 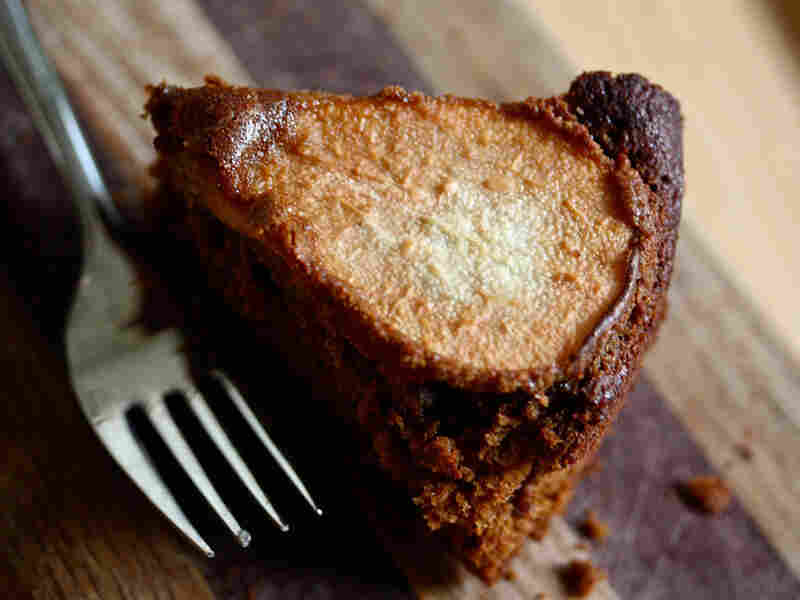 Try using half whole-wheat pastry flour in cake or pie recipes. This works particularly well in chocolate cake or a pie crust. The pastry flour is a finer grind than regular whole-wheat flour, and though the texture is a bit different, it still works, particularly if you give your palate some time to adjust. Make brown rice with vegetable or chicken broth rather than water (try two cups broth to one cup of rice, adding a teaspoon of olive oil and a pinch of salt to boost flavor and consistency). Or switch out the rice for quinoa, the high-protein seed (generally considered a whole grain) that cooks quickly and has a light, nutty texture. Make it even simpler on yourself by choosing whole-wheat pasta — in recent years it has become much more palatable — or go for whole-grain bread (and English muffins, tortillas, etc.) rather than the white-flour option. Some cooking tips: Rinse grains thoroughly in cold water just before cooking until the water runs clear, then strain to remove any dirt or debris. As a general rule, boil two parts water to one part grain, then add the grain, return water to a boil and simmer, covered, until tender. Test for doneness before removing from heat. Grains should be slightly chewy when cooked. I like to throw a few varieties of whole grains together and cook them down into a thick, chewy porridge to be seasoned, either sweet or savory. For example, combine one cup long-grain brown rice, one cup millet, 1/2 cup barley, 1/2 cup oats, 1/2 cup wild rice and a teaspoon of salt, then cover with water about 2 inches above the grains. Bring to a boil, then cook, uncovered, at a simmer until all of the water is absorbed. I'll eat this for breakfast with a sliced banana, honey and walnuts, or as an accompaniment for a chickpea-chard stir-fry at dinner with a little soy sauce. The real revelation is not just that whole grains are good for you, but that they taste good. As the new year begins, anything is possible. I swear the sun shines brighter, and waves crash and beat against the rocks with more force — on New Year's Eve, the sun sank down under the horizon into the sea in a flaming brilliance I have never quite seen before. The crescent moon swung over the cypress trees opposite, like a still and shining ship, and the air seemed charged with possibility and hope. In these first days of the new year, I like to treat myself to a nourishing and simple vegetable-grain soup: quinoa and spinach, perhaps, or roasted vegetable barley. It's good to eat during what are invariably rather quiet and introspective days. Next year, I might have to follow my traditional steaming bowl with a slice of whole-wheat gingerbread, or a piece of almond-teff tart. Whole grains and I are going to be together for decades to come. 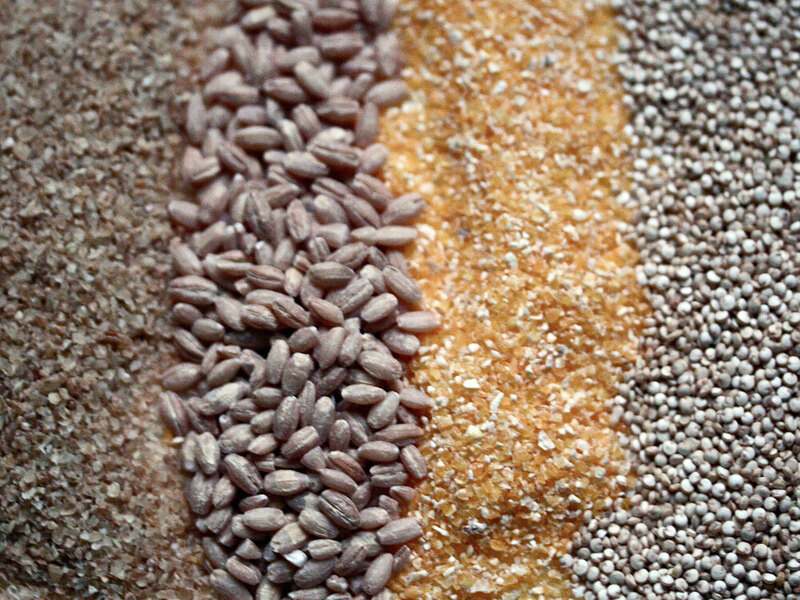 Bulgur (from left), barley, cornmeal and quinoa. Amaranth. Seeds are crunchy and flavorful. Amaranth flour (ground from the seeds) can be used in cookies or pastas. Toast the seeds in a dry, covered skillet over medium heat until browned and beginning to pop, or simmer 1 cup of the seeds in 2 1/2 cups of water and eat for breakfast as you would oatmeal. Buckwheat. Also labeled as groats or toasted groats (which are labeled kasha). Add 1 cup of groats or kasha to 2 cups of salted boiling water and simmer until the liquid has been absorbed, about 10 minutes. Let stand covered briefly, then fluff and serve in place of rice in pilafs or in a vegetable salad. Bulgur. Wheat berries that have been steamed, dried and cracked. Look mostly for the fine grind. Add 1 cup of bulgur to 2 cups of salted boiling water and simmer until the liquid has been absorbed, about 10 minutes. Let stand covered briefly, then fluff and serve. Use in tabbouleh or salads. Cornmeal. Look for whole-ground cornmeal to use in pancakes, corn tortillas and cornbread, or as polenta. Farro. An ancient strain of wheat with a chewy texture and nutty flavor. 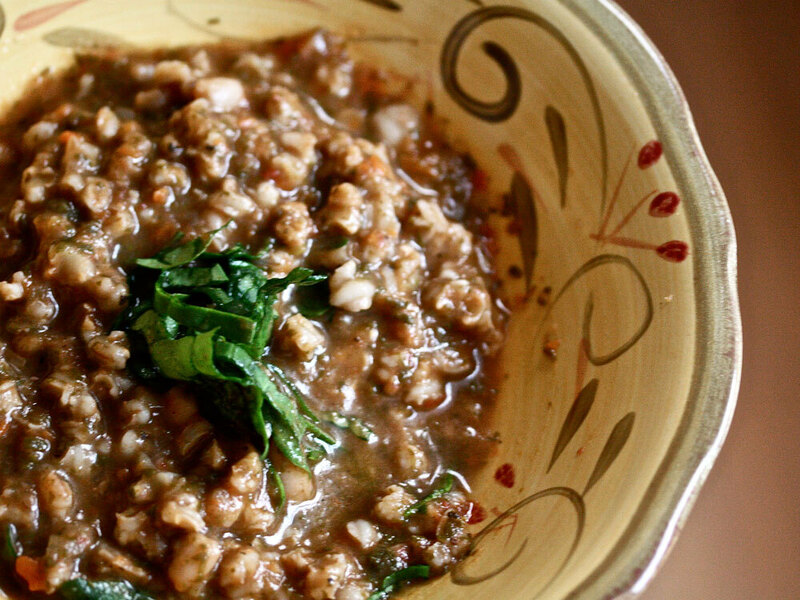 Soak farro for at least 20 minutes and for up to 12 hours, then simmer in a large pot of heavily salted water until tender, 20 to 40 minutes depending on the type of farro being used. Drain and serve. Millet. Takes about 15 minutes to steam, and can be mixed with vegetables and stuffed in roasted red peppers, tomatoes or zucchini. Oats. High in fiber and an aid in lowering cholesterol, oats are most often eaten as a breakfast porridge but can be used in cookies, bread and cereal, and for brewing beer. Quinoa. High in protein and amino acids. Wash quinoa thoroughly before cooking to remove its soapy saponin coating. Cook for about 15 minutes and use in place of rice, or in soups, stews or stir-fries, or as a breakfast cereal. Teff. The staple grain of Ethiopia. Gluten-free, and can be used to make flatbread or to lighten baked goods. Most supermarkets carry at least a few options for whole grains, and natural or health food stores tend to carry a wider variety. Otherwise , Bob's Red Mill carries many varieties online. I like to add a bit of quinoa for crunch, but if the texture is too unfamiliar, feel free to omit and add two more tablespoons of whole wheat flour instead. If you'd like to cut the butter, try using 1/4 cup applesauce or 1/4 cup vegetable oil instead. Whisk together dry ingredients in a large bowl. Whisk together eggs, buttermilk and vanilla in a small bowl until smooth. Add the wet ingredients to the dry ingredients and stir just until combined, then whisk in the melted butter. Heat a large nonstick skillet over medium heat. When hot, butter the pan lightly, then drop the batter by scant 2 tablespoonfuls, 3 to 4 at a time. 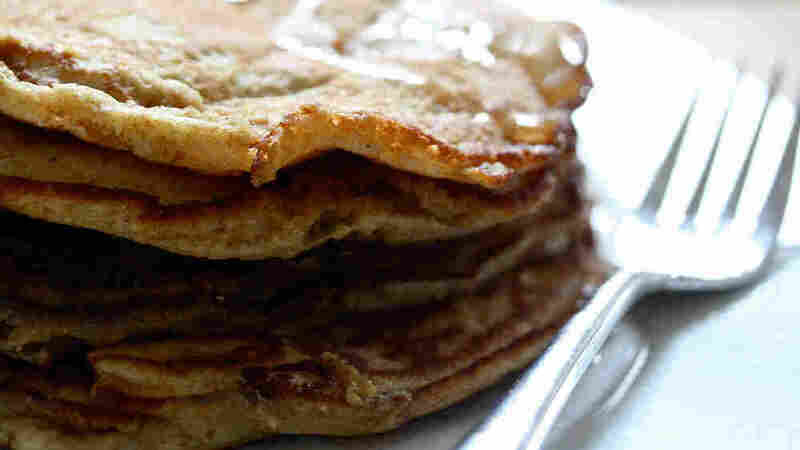 Cook pancakes for 1 to 2 minutes, or until golden brown, then flip and cook 1 minute more. Serve hot, and repeat with remaining batter, buttering pan as needed. Whole-wheat pastry flour is a perfect complement to rich molasses and sweet pears in this wintery dessert. Butter and flour an 8-inch square, heavy aluminum cake pan. In a medium bowl, sift together the flour, baking powder, ground ginger, cinnamon and salt. Stir in the fresh ginger. Set aside. In a large bowl, beat the butter until creamy. Add the brown sugar and beat until the mixture is pale and fluffy. Slowly drizzle in the egg, beating each addition until incorporated before continuing. Beat in the molasses. Reduce the speed to medium-low and add the flour mixture in 3 additions, alternating with the milk and beginning and ending with the flour. Beat just until combined. Pour the batter into the prepared pan and arrange the pear quarters on top, skin side up. Bake until the top of the cake is puffed, 35 to 40 minutes. Transfer the pan to a wire rack and let cool for 10 minutes. 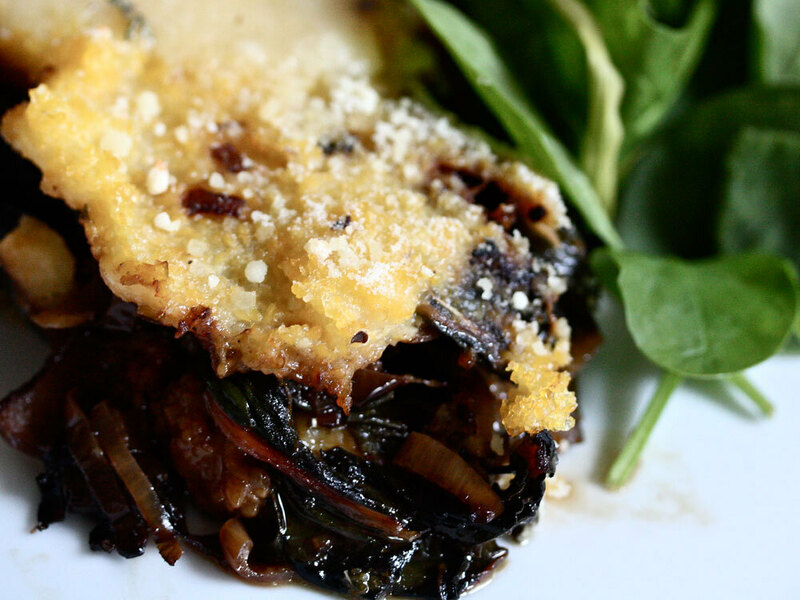 Whole-grain polenta makes a hearty substitute for pasta in a sort of free-form lasagna with seasonal vegetables. To make the polenta, bring the 6 cups of water to a boil in a heavy large saucepan. Add the salt. Gradually whisk in the cornmeal. Reduce the heat to low and cook until the mixture thickens and the cornmeal is tender, stirring often, about 15 minutes. Add half of the Gruyere. Remove from heat. Meanwhile, in a frying pan, heat the olive oil over medium heat. Add the leeks and rosemary and saute until soft, about 5 minutes. Add the chard, the wine and a few tablespoons of water, stirring well to coat with oil. Add more water as necessary until the chard is wilted and soft. In a 3-quart gratin dish, spread half of the polenta, then top with the leek-chard mixture. Spinkle the rest of the Gruyere over the top. Spoon the remaining polenta over the chard, smoothing with a spatula. Sprinkle with salt, pepper and Parmesan. Bake uncovered for about 30 minutes or until the gratin is hot and bubbly. 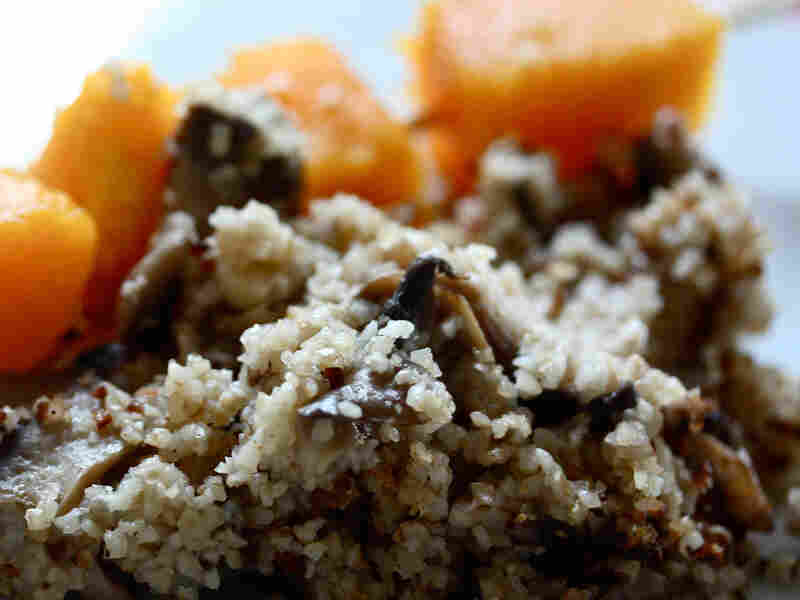 Bulgur mixed with mushrooms and almonds and paired with roasted butternut squash makes a satisfying seasonal vegetarian main dish. Cook onion and garlic in oil in a 2-quart heavy saucepan over moderate heat, stirring occasionally, until golden brown, 5 to 7 minutes. Add the mushrooms and cook another 5 minutes, until mushrooms are tender. Add the bulgur and salt to the pot and cook, stirring, for 1 minute. Stir in the water, bring to a boil, then reduce heat and simmer, covered, until liquid is absorbed, about 15 minutes. Remove from heat and let stand, covered, 5 minutes. Fluff with a fork, then stir in almonds and pepper. Serve warm or at room temperature. Place squash in an oven-safe dish, drizzle with 2 tablespoons olive oil and roast for 20 minutes, until squash are crisp tender. Thread squash onto skewers and set aside. In a small saucepan, heat olive oil over medium heat. Add sugar, maple syrup and sage. Season with salt and pepper. Brush mixture over squash. Grill squash until brown and tender, about 8 minutes. Drape over a portion of pilaf to serve. Pureeing the beans and vegetables makes for a hearty and satisfying broth that stands up well against the farro. I like to eat this with good fresh bread or a simple salad. Heat 3 tablespoons oil in a 5- to 6-quart heavy pot over moderate heat until hot but not smoking, then cook onion, carrots, celery and garlic, stirring occasionally, until onion is softened, about 10 minutes. Stir in water, 3/4 of the beans, tomato, spinach, parsley, sage and thyme and bring to a boil, then reduce heat and cook at a simmer, partially covered, for about 10 minutes. Discard thyme sprigs, then, using a hand blender or a food processor, blend until fairly smooth but still a little chunky. Bring soup to a boil. Add farro and salt, then reduce heat and simmer, stirring frequently, until farro is tender (it will be chewy like barley), about 30 minutes. Add the rest of the beans, stir in pepper and add more salt to taste.